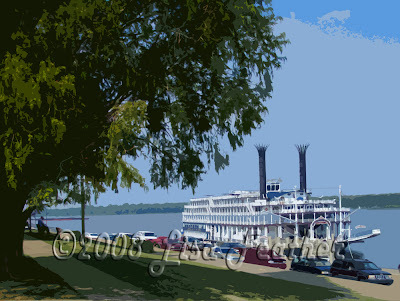 This is a classic scene from the riverfront in Paducah, Ky. Riverboats stop here to let their passengers explore the history and culture of the area in Paducah's wonderful museums and galleries. Steamboats have been a part of American culture since the 1800's. They now remain active offering historic river cruises. This image,of a nostalgic steamboat and a spot of deep southern shade reminds me of some of the most wonderful elements of summer.